Mix yogurt and egg in a medium bowl until blended and smooth. Add flour and baking soda and stir until the dry ingredients are mixed in. The batter will be thick. Preheat a griddle or large pan to medium heat. Spray with nonstick spray. Use an ice cream scoop or 1/4 to 1/3 cup measuring cup to scoop the batter into the pan. Spread each of the batter scoops into an even circle. 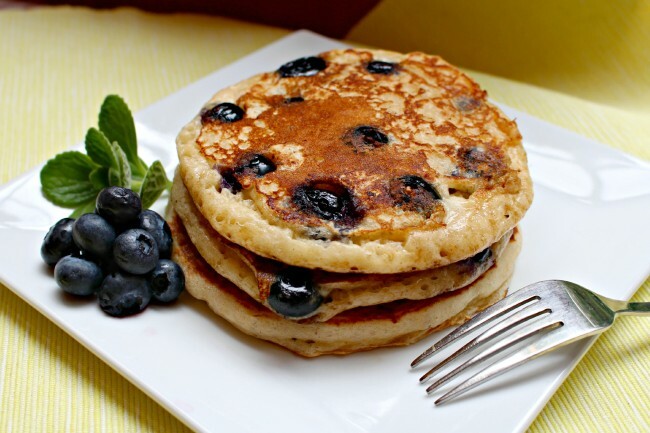 Dot blueberries or bananas on top of each pancake. Cook for about 3 minutes or until golden brown, then flip and cook the other side for about 2 minutes, until it is golden brown too. Repeat with the remaining batter. Serve with additional fruit and/or syrup.